Living area, couches, living area. 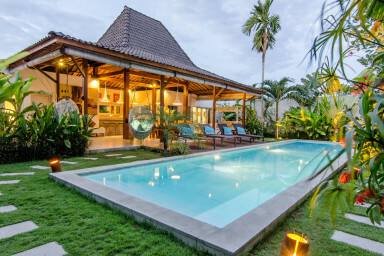 Located in a quiet corner in the centre of Bali’s most glamorous beach town – this four-bedroom luxury villa in Seminyak is only a short walk from the beach and the famous shopping street of Jalan Kayu Aya. Villa Sukacita’s authentic Indonesian design allows for maximum airflow and natural cool – perfect if you want to experience the comfort of tropical outdoor living. It has a very spacious living and dining area which overlooks the lush garden and large private swimming pool. Whether you’re enjoying the comfort of your sunbed or swinging back a freshly-made mojito from one of the dreamy hanging chairs – life really doesn’t get better much than this. The dining area has a large table which comfortably seats eight people. The living area has two comfortable sofas (one can double as an additional single bed if required). This is the perfect spot to enjoy a cosy evening after a long hard day of tanning, shopping or surfing. The Joglo bedroom with ensuite bathroom is located upstairs across the main building. and is simply striking. Its wooden panelling and authentic Balinese ornaments will transport you to a bygone era of vintage romance and comfort. There are two guest bedrooms that each come with a queen-size bed, as well as a third guest bedroom with two twin beds. Each bedroom combines sleek luxury with authentic Indonesian warmth and comes with an ensuite bathroom with toilet and shower. There’s a large open-plan kitchen with all mod cons. It has a granite worktop and a large kitchen island which is wonderful if you enjoy cooking. We’d very much recommend you let our private chef take care of the cooking instead, so you can focus on fully enjoying your holiday. At an additional cost she’ll prepare you the most delicious daily breakfasts, lunches and/or dinners. She’ll also gladly throw in a little masterclass in Indonesian cooking – perfect if you want to impress the crowd back home. Everything was super easy, perfect location, lovely helpers and Dolla managed all our inquiries. Will be back !